Today we are going to look at 5 great uses for garlic scapes. Garlic Scapes are one of those unique pleasures, known only to gourmet speciality shoppers and garlic farmers and gardeners. With the same basic garlic flavor, a texture similar to asparagus, and the versatility of chives, garlic scapes can be an excellent reward for those who choose to grow hard neck garlic varieties in their home gardens. 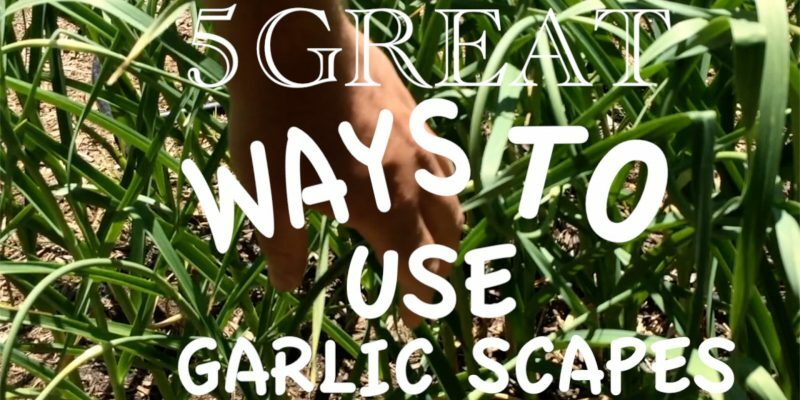 We already discussed when and how to harvest garlic scapes in a previous video, so today we are showing off 5 great ways to use them. The first is to make garlic scape powder. It is a bit less potent than normal garlic powder and has a subtely aromatic fresh quality to it, but can be used in much the same way. You will want to begin by chopping your garlic scapes and then, if you have one, using a food processor to really get it down to a puree. After you have the garlic puree, spread it onto a fruit leather tray for a dehydrator. You will be using your dehydrator’s lowest setting, probably between 95 degrees farenheit and 105 degrees fahrenheit. If you do not have a dehydrator you can spread the mixture on parchment paper, and put in a warm dry place with good air flow. I put my dehydrator outside because the garlic smell, while pleasant, can be overpowering indoors. After the mixture is dry you can use it as is, or grind it into a much finer powder. A coffee grinder will work. I am using the grinder on a Magic Bullet to grind mine. And there you have it: garlic scape powder, ready to use. The second up is making a ready made garlic scape seasoned olive oil that can be used in future cooking. After you have chopped scapes into a puree in a food processor, scoop the pureed scapes evenly into an icecube tray. Top the ice cube tray with olive oil and put the entire tray in the freezer. After the olive oil freezes, break the cubes out of the tray, and store them in a Zip-Loc freezer bag. Now anytime you need some garlic seasoned olive oil, you can pull out a cube and use it. You can use water rather than oil, if you have recipies for which olive oil would not be appropriate. Next up is garlic scape pesto. Use your favorite pesto recipe, and substitute in garlic scapes in place of garlic, and depending on your taste, add garlic scapes in place of the basil. If you do not have a favorite pesto recipe, I will be adding a a post with my full horseradish leaf/garlic scape pesto, that uses sunflower seeds rather than pine nuts as well. It made a delicious pesto and used several of my garden ingredients. Fourth is to sauté the garlic scapes. Sautéd garlic scapes take on their own unique flavor. If you have ever roasted garlic, that delightful nutty taste comes across well in a sautéd garlic scape. You can use saüted garlic scapes on their own, as a topping on pizza, or in any number of creative ways. Here I am sautéing mine with onions and peppers for a delightful vegetable medley. Our fifth outstanding use for garlic scapes is in a dip. Scapes give a fresh garlic flavor, and can be used in numerous dips and spreads. Here I use cream cheese, some well chopped garlic scapes, and some chopped garden dill. I stir it together until it is well combined. This makes a great spread for crackers or bagels. To use as a veggied dip, add in some milk or creme to thin the texture a bit. Here, I am adding this as a cheese filling for an omelet. What a bright flavor it adds. Do you have any favorite ways to cook garlic scapes that did not make it in this video? Let us know in the comments below. Give us a big thumbs up if you liked this video. Transplanting Jimmy Nardello Peppers and Black Vernissage Tomatoes.